Alyce clover, false moneywort (FAO, 2010). Alyce clover is also used for Alysicarpus vaginalis. Alyce clover (Alysicarpus ovalifolius (Schumach. & Thonn.) 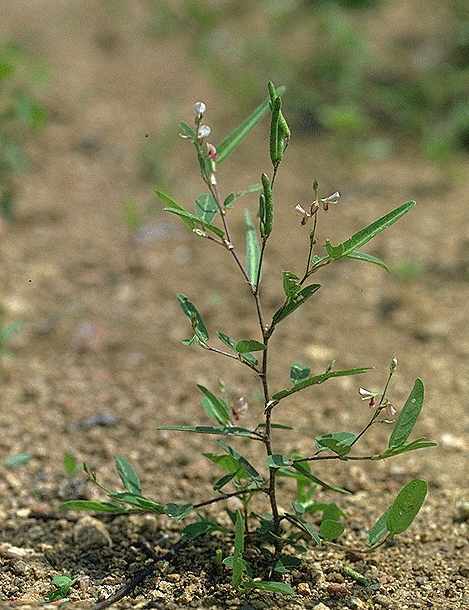 J. Léonard) is an erect or spreading annual herbaceous legume (sometimes woody at the base) very variable in size (2-60 cm tall) and in shape (Mannetje, 2002; Jamnadass et al., 2006). The stems are decumbent, slightly pubescent when young and almost glabrous with age. The single leaves are alternate; leaflets are oblong or narrowly lanceolate, 1-10 cm long × 0.5-3 cm broad. Inflorescences are pseudo racemes, sometimes panicled. Flowers are orange-buff to pink or reddish-violet. Fruits are indehiscent oblong pods of 18-25 mm; seeds are oblong-ellipsoid, 2.5 mm × 1.5 mm × 1.2 mm (Mannetje, 2002). Alysicarpus ovalifolius is very similar to Alysicarpus rugosus or Alysicarpus glumaceus during the vegetative stages, thus difficult to identify (CIRAD, 2010). Alysicarpus ovalifolius is a protein-rich fodder valuable for all types of livestock. It is available during the rainy season and in early stages of drought periods (FAO, 2010). It is very palatable to animals that graze in rangelands. It may be used as bush straw or bush hay in sheep diets (ICRISAT, 2005). In Niger, it is a valuable component of vegetation collected and traded as fodder (Mannetje, 2002). It is a weed in millet crops but exploited as a fodder (Lamers et al., 1996). However, it was not cultivated until recently (FAO, 2010). 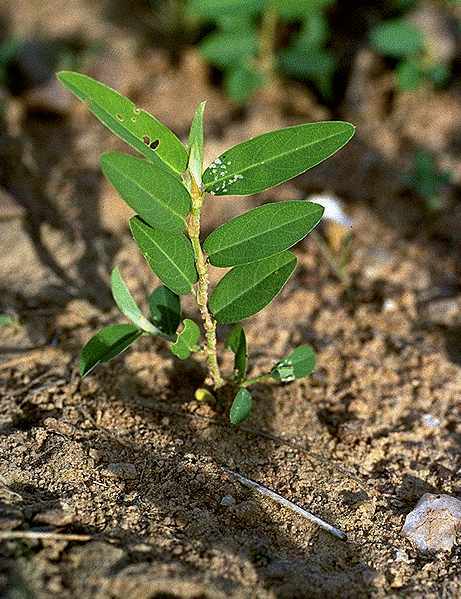 An attempt was made in Burkina Faso to sow Alysicarpus ovalifolius in order to enhance the value of natural pastures and it proved to settle efficiently after sowing (Kiema et al., 2006). Alysicarpus is native to tropical Africa, Madagascar, Afghanistan, India, Pakistan, Vietnam and Indonesia. It is widespread throughout the tropics. Alysicarpus ovalifolius usually grows in savanna and is also frequently found in croplands (as a weed) and fallow lands. It is common in Soudano-Sahelian countries where it grows in natural pastures with Cenchrus biflorus and Zornia glochidiata (FAO, 2010). Alysicarpus ovalifolius withstands drier conditions and heavier grazing than Alysicarpus rugosus thanks to its capacity to flower and set seeds very quickly (Grouzis, 1988). Optimal growth conditions are 200-600 mm annual rainfall on sandy soils. It grows from sea level up to an altitude of 900 m. It has medium drought tolerance (FAO, 2010; Mannetje, 2002). 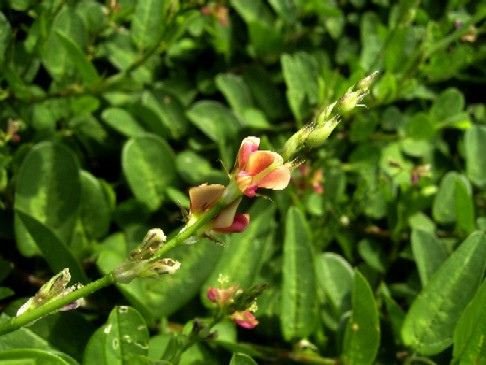 Alyce clover is an N-fixing legume (Mannetje, 2002). Alysicarpus ovalifolius is a protein fodder. In Central Mali, the crude protein content of Alysicarpus ovalifolius samples, collected from sites with different soils and rainfall regimes, varied from 9.4 to 21.8% DM, with 63% of the samples containing 12.5 to 15.6% crude protein (Breman et al., 1984). In a survey in Niger of dried Alysicarpus ovalifolius weeds (from millet crops) sold on local markets, crude protein varied from 14.1% to 31.1%, but decreased with increasing age of the plant at harvest. Contents of total tannins (0.6-0.8 g/kg DM) and condensed tannins (0.05-0.15 g/kg DM) were relatively low (Lamers et al., 1996). Ruminant ME estimated from the gas production method increased up to 49 days after planting millet, reaching 7.1 MJ/kg DM and decreased thereafter. As a weed in millet crops, Alysicarpus ovalifolius is well appreciated by farmers in Niger (Lamers et al., 1993). It is also considered valuable in pastures (Floret et al., 2000). However, it is usually present as one species among others in the pasture and rarely evaluated alone (Lamers et al., 1996; Compère et al., 1990). In Senegal, a pasture mixture of Alysicarpus ovalifolius, Cenchrus biflorus, Dactyloctenium aegyptium and other species had a digestibility of 70% in the wet season and 53% in the dry season. Sheep gained 78-100 g/d in the wet season but did not maintain weight in the dry season. Cattle could graze part of the area during the wet season, with the remaining area supplying sufficient straw to maintain the cattle during the dry season (Compère et al., 1990). Breman, H. ; van Keulan, H. ; Ketelaars, J. J. M. H., 1984. Land-evaluation for semi-arid rangeland, a critical review of concepts. In: Proceedings of the Workshop on Land Evaluation for Extensive Grazing (LEEG). International Institute for Land Reclamation and Improvement, Wageningen, The Netherlands. 343 p.